Sorry to hear about your plant, but WOW fantasic photos! I have a budding dragon flower again! 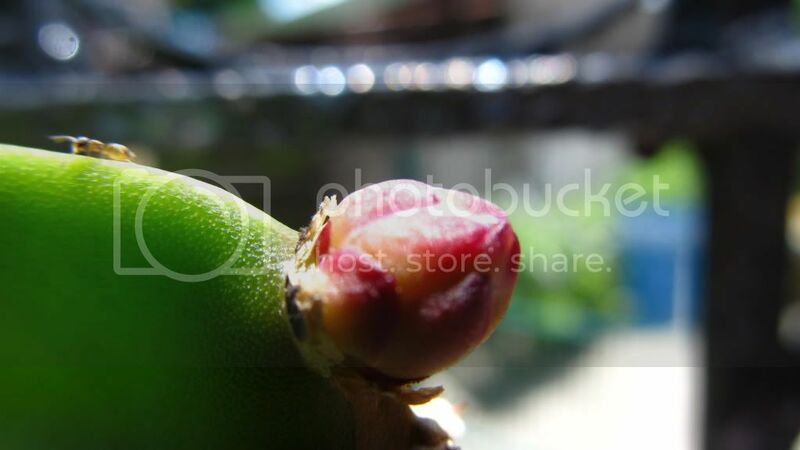 I'm crossing my fingers hoping that this bud will continue to grow. as a result of 2 weeks nonstop rain. my dragon cacti's base is rotting. can i cut the main stem and let the wound dry for a days then apply fungicide then plant it again into fresh dirt? would that be a better idea or divide the stems into several pieces then plant them all? Either way would probably work fine, but I think I would take several cuttings, to get as many plants as possible. Is there any way you could provide protection against heavy rain like that? Yummmm dragon fruit makes my mouth water! I read somewhere that Pitaya are self-sterile eventhough their flowers have both sexes. They need to cross pollinate with another pitaya to bear fruit; otherwise you'll get plenty of flowers but no nomnoms. Would love to grow one here but I think trying for jungle/subtropical cacti in USDA zone 3A is pushing it a bit I wish Father Christmas or the Great Pumpkin would let me have a huge tropical greenhouse set-up! I could move the plant to a roofed area. I just really didn't expect that the 2 weeks rain will cause this problem for that cacti. I wonder if planting them in a raised bed filled with a very rapidly draining soil might help. That way, even if there was heavy rainfall, it would drain away rapidly. That might help prevent rot from setting in. I have to use raised beds for many plants, especially those that are sensitive to too much water, simply because my yard is heavy clay soil with poor drainage. Also, the water table is high where I live. I hit water whenever I dig down about 12". I think Kisal's on to something here - Dragonfruits in their natural environment are epiphytes and as such where they grow doesn't really hold a whole lot of water (although it does rain quite heavily). I think a raised bed with a very fast-draining medium might help them a lot. How often do you have to water dragonfruit? As it's a cacti, I assume not very often.. but it also fruits. So does one increase the watering when the plant is in fruit only? 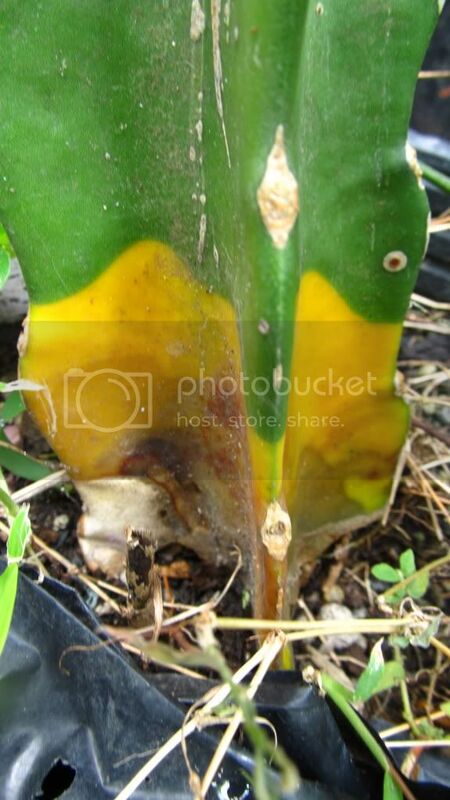 i think i have successfully saved my cacti by cutting it into 3 segments then planted it after the wounds healed. one segment already have a new growth bud. will post pics on weekend..
What zones are these hardy to? here is the new growth on my recovered dragon cactus cuttings. glad to know that the cutting is now stable. 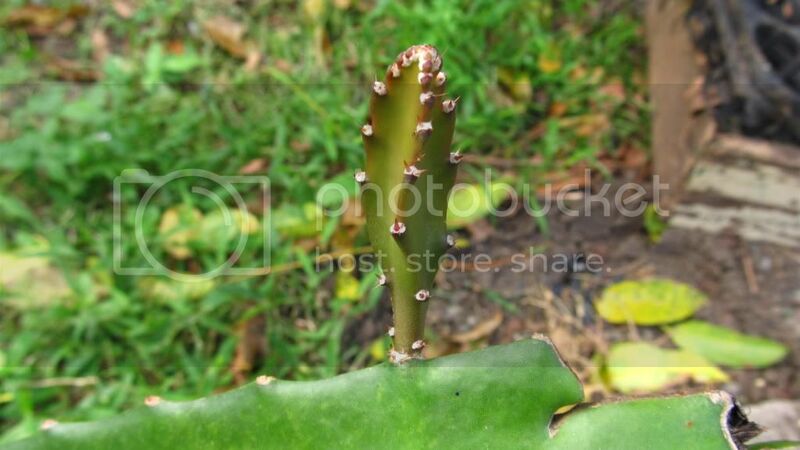 Dragon fruit stem rotting/diseased? (Pics) Spreading fast.